The subwoofer model ELC15SUB is a horn-loaded 15" subwoofer with integrated flyware. 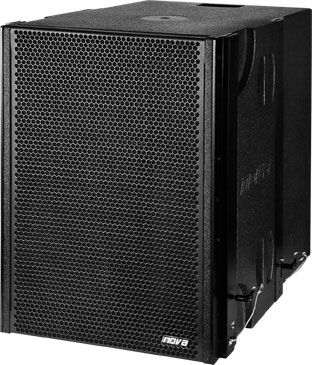 The multifunctional ELC15SUB was designed for the use with the ELC26 line array module. The clever design allows the operation as stacked version or as flown system. With a very high load capacity and a sound pressure of 133 dB, the ELC15SUB is the ideal complement to ELC26. The ELC15SUB is a subwoofer in a rectangular chassis for fixed installations and mobile use. The subwoofer is equipped with one high-performance 15" speaker (3” voice coil), which is hornloaded for more sound pressure. The ELC15SUB can be flown by using the EC1 flyframe. The ELC15SUB is compatible with the ELC26 line array module. The ELC15SUB can be also used for ground-stacked applications in combination with the ELC26 line array module without any adapter or additional frame. The chassis is constructed from 15 mm plywood (birch) and covered with black PolyCoat© finish. The cabinet is equipped with two grip handles and one front grill with transparent charcoal foam backing. Two speakon connectors (NL4) are mounted at the rear side of the chassis for signal input (input) and signal link (link).The power rating of the ELC15SUB is 600W(RMS), the impedance is 8 ohms.